Windows Media Player is a digital media player developed by Microsoft that is used for playing audios and videos. 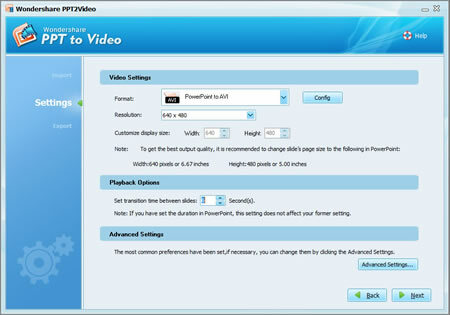 Commonly, WMV, ASF, WMV, WM, WAV, and AVI files are able to be played on this video player. But some other video formats like MOV, MP4, RAM and RM are not. So, how can we view PowerPoint presentations in Windows Media Player? What can we do for turning PowerPoint files to videos compatible with Windows Media Player? In these versions of PowerPoint, there is no built-in option for you to save your PPT as Windows Media Player videos. You need to use some third-party tools to help you finish the conversion. There are both free and cost-effective tools for you, but if you want to get an excellent output video quality, and save your time to do this, it’s better to use a professional one. This PowerPoint to video converter – Wondershare PPT2Video is recommended. It enables you to convert your PowerPoint files to various video formats such as AVI, WMV, ASF, and MPEG. Most of them are compatible with Windows M	dia Player. You don’t need to worry about if the animations, transitions, pictures, or sounds in your PPT will lose. All the features you add to PowerPoint will display the same in the video after conversion. Also, with this tool, you can use the shortest time to generate a video from your PowerPoint compared with using other tools. You can directly save PPT files as a Windows Media Player video with the built-in option of PowerPoint 2010. Click Back button -> Share -> Create a Video -> Set output video quality -> Create Video. Then, your presentation will be saved as a WMV video. If you want to convert your PowerPoint 2010 to HD WMV or more popular video formats, the PowerPoint to video converter recommended above works good for you. After converting PowerPoint to video, you can directly view your PPT through Windows Media Players. It helps you share business/celebration PowerPoint slideshows more conveniently, no need to worry if there is MS PowerPoint installed on the computer or not. For people who have windows mobile devices, it also helps them to view PowerPoint presentations anywhere if they like. As in Windows operating system, Windows Media Player is available for download. Play PowerPoint in Windows Media Player, enjoy the special experience now.